I’ve always loved bread! And I still love a fresh-from-the-oven, crunchy-crusted bread every once in a while. I can drool by the smell of freshly baked goods, who doesn’t? But I’ve decreased my bread consumption drastically for a while now and that makes me feel good; no more bloated feeling in the stomach. You can make a bigger batch of the crackers and safe them a few days in an air-tight container. Ideal as a quick snack or as a lunch-to-go! You can make delicious spreads with several vegetables. For example the Lentil and Artichoke Hummus I made recently, or my Homemade Tapenade with sundried tomatoes, sjalot and fresh herbs (and while writing this I think: “ohhh why didn’t I put in some olives??”). Or what about a homemade Nutella Spread based on avocado? I can think of several other yummy and healthy spreads and dips, oh I promise to share more and more recipes with you, feeling already excited to get in the kitchen and to make some yummy stuff! 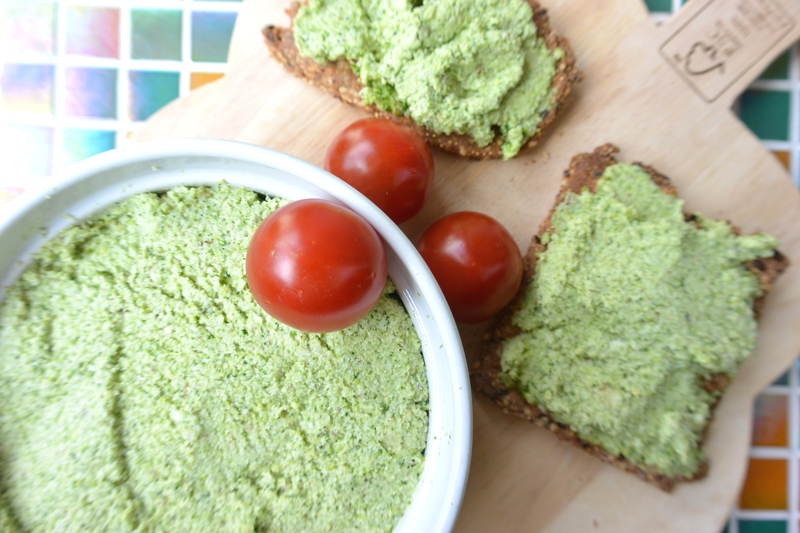 This Broccoli Spread is easy to make, all you need is a simple food processor and some ingredients! 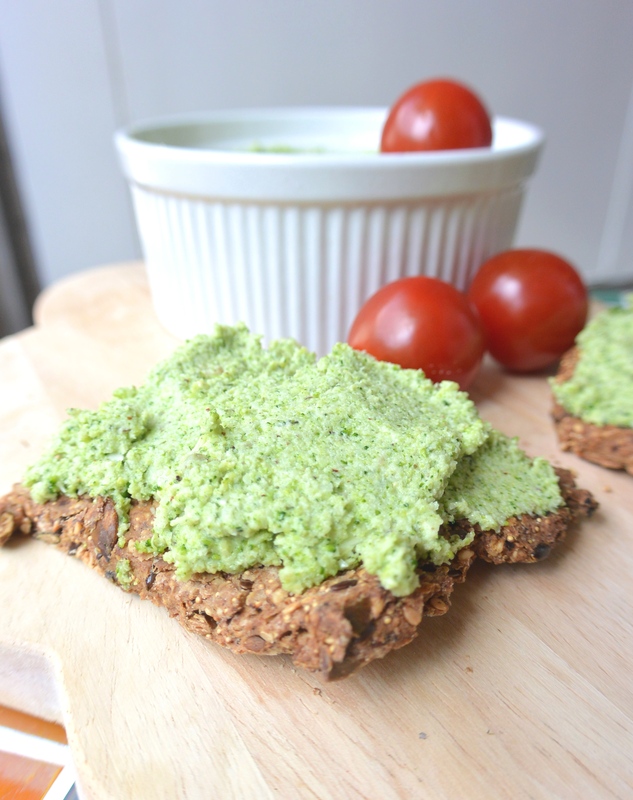 You can use this as a spread on top of crackers, but as a dip with crudités as well! The broccoli makes this spread a healthy-vitamin-and-fibre bomb with lots of vitamin C, calcium and beta-caroten. The (cold-pressed) flaxseedoil is a good source of Omega-3 fatties. So you don’t have to be modest when using this spread! Seasalt and pepper to taste. Broccoli is from the cabbage-family. Eating it raw can be troublesome for some people, therefore you can choose to briefly steam the broccoli first! Just chop it up into smaller pieces, steam it for just a few minutes and let it cool down. When cooled, add to the food processor together with the Brazil nuts, garlic, tarragon and flaxseed oil and mix into a thick ‘paste’. (Steaming the broccoli is not neccesary I’ve you have no troubles digesting raw cabbage-like foods). You can choose to mix in the chiaseeds as well or to spoon them in afterwards. You can save the Broccoli Spread in an air-tight container in the fridge for 2 days. Posted in Lunch, recipes, Snacks, VeganTagged broccoli, fit, food, healthy, healthy lifestyle, healthy snack, homemade, lunch, natural, nuts, raw, recipe, seeds, snack, soyfree, spread, sugarfree, suikervrij, vegan, vegetable, vegetables, vegetarian, veggie, veggies, zuivelvrijBookmark the permalink.